CMBO is pleased to provide weekly summaries of the Cape's birding highlights. Coverage is limited to bird sightings in Cape May County. Readers should keep in mind that some reports may not be confirmed. The vast majority of information utilized in these reports comes from eBird data and "Keekeekerr" text alerts. Observers are also encouraged to send reports and photos to compiler Tom Reed (coturnicops at gmail dot com). Location Abbreviations/Explanations: CMP (town of Cape May Point); CMPSP (Cape May Point State Park); WMA (Wildlife Management Area). Access Note: Stone Harbor Point is open to public access again. Waterbird migration continued to slowly pick up the pace in recent days. Westerly winds produced small movements of Snow Geese and Canada Geese 21–22 Mar (m. ob.). At least 9 Snow Geese lingered at Reed's Beach through 27 Mar (TR). 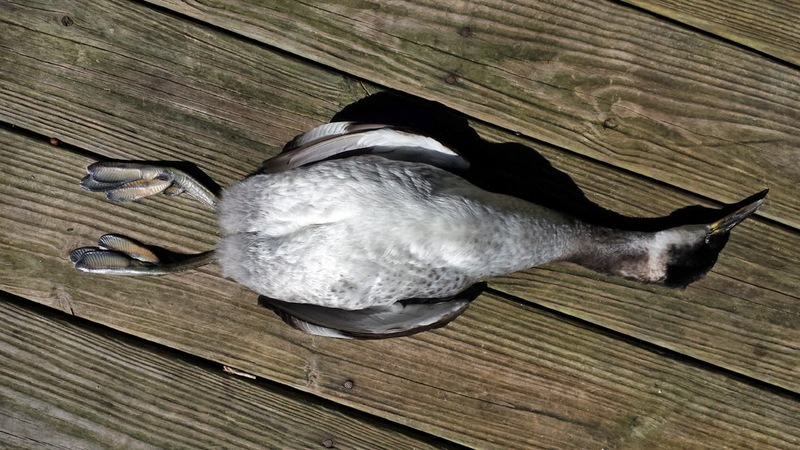 More notable lingerers included 5 Redheads at Cox Hall Creek WMA and 2 Canvasbacks at CMPSP through the period (m. ob. ), along with 2 Tundra Swans still present at CMPSP 27 Mar (m. ob.). A strong total of 190+ Wood Ducks moved north past CMP 27 Mar (m. ob.). The second half of March can be a good time to find northbound Eurasian Wigeon; a drake played hide-and-seek with birders at CMPSP 21–23 Mar (m. ob.). Wild Turkey became much more conspicuous in recent days. Notably, at least 6 were seen on several days around residential CMP (m. ob.). 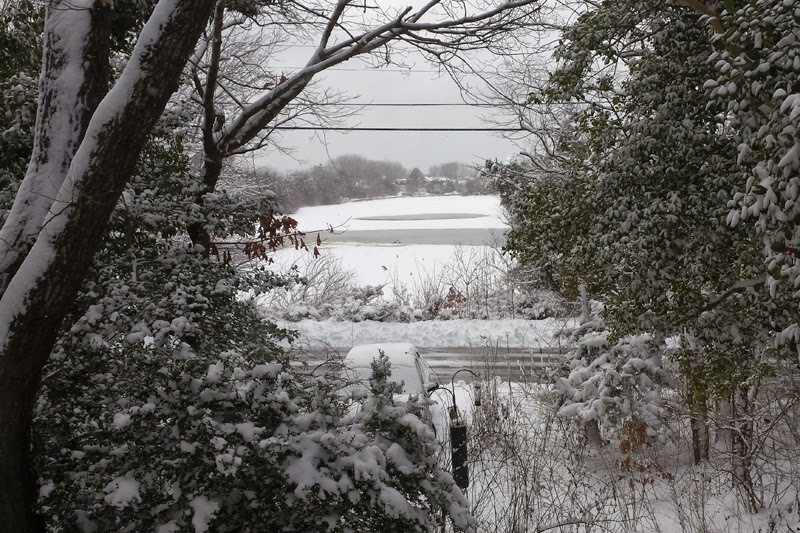 The year's first Snowy Egrets flew past CMP 27 Mar (TR et al.). A Northern Goshawk, perhaps the same individual seen earlier in the month, cruised past CMP 26 Mar (CB, TR). A migrating Golden Eagle made for a surprising sight over Stone Harbor Boulevard 24 Mar (WK). Osprey continued to arrive, with an influx of active migrants 23 Mar (m. ob.). Migrant shorebirds played a more prominent role this week. Piping Plovers continued to filter in, with a recent max of 15 at 111th Street, Stone Harbor 23 Mar (TR). Killdeer have been noted on a daily basis, with small flocks regularly passing north over Cape Island. Both Greater and Lesser Yellowlegs arrived at several sites throughout the peninsula, and Wilson's Snipe have become a more regular sight at Cape Island-- a flock of 10 flew over WCM 27 Mar (MO). 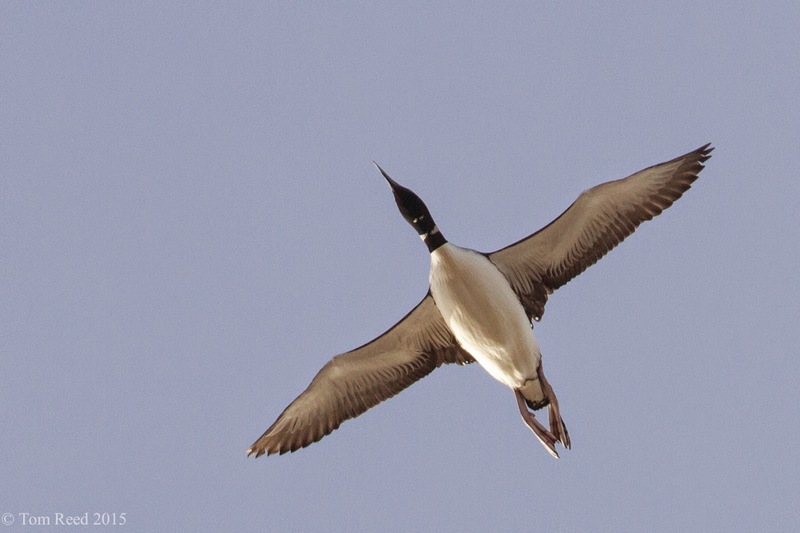 Reports of alcids have been few since early-Feb; a single Razorbill flew south past CMP 21 Mar (TR). At least 2 Black-headed Gulls remained along the lower bayshore, with recent reports from Miami Ave, Villas (m. ob.). CMP's Eurasian Collared-Dove was most recently seen at the entrance to CMPSP 26 Mar (m. ob.). Rare as a spring migrant, a Lapland Longspur put in a brief appearance over CMP 22 Mar (TR). The first obvious wave of landbird migrants occurred 26–27 Mar, and included widespread reports of Tree Swallow, Eastern Phoebe, Northern Flicker, Pine Warbler, and various sparrows. A remarkable fallout of Pine Warblers 26 Mar involved 120+ at Cape Island, with 100+ at CMP (m. ob.). Another 30+ were tallied at CMP 27 Mar (TR et al.). The year's first Yellow-throated Warbler was encountered at the South Cape May Meadows 26 Mar (KH). Notable Rusty Blackbird totals included 26 at the Rea Farm/Beanery 22 Mar (CB, TR) and 36 at Higbee Beach WMA 26 Mar (DF). Catherine Busch (CB), Don Freiday (DF), Kathy Horn (KH), Will Kerling (WK), Michael O'Brien (MO), Tom Reed (TR). eBird. 2012. eBird: An online database of bird distribution and abundance [web application]. eBird, Cornell Lab of Ornithology, Ithaca, New York. Available: http://www.ebird.org. (Accessed: 27 March 2015). Fogg, B. 2013. Keekeekerr: Recent Text Alerts. Available: http://keekeekerr.com/textalerts/keekeekerr. (Accessed: 27 March 2015). While the continuing cold weather certainly doesn't make it feel like spring, spring it most certainly is. This is always a trying season for us humans it seems; when we naturalist types think of spring we have a tendency to think of full-on spring, much later into the season, when rainbow-colored warblers are flitting through the trees, the browns of winter have been fully replaced by the green cloak of summer and bird song is everywhere. This is spring in late May - heading rapidly toward early summer; yet spring begins much earlier of course. Spring in Cape May can start as early as late February, but we don't always pick up on those early changes. When it is as cold as it has been this year so far, spring can certainly be slow to get going and I was amazed to find, two years ago, I was photographing Wood Frogs in late February! Certainly the activities of reptiles and amphibians are temperature controlled and so each year is different while we are waiting for the frog chorus to begin. But many things in nature are controlled more by day length than by temperature, so they will start whatever the weather - though heavily overcast days can have a negative effect for a while. Northern Cardinals, Red-winged Blackbirds and Song Sparrows all start singing right on queue, controlled by increasing daylight levels as spring days start to get longer. The same is true of many spring flowers and it is not an uncommon sight to see the first flowers of spring poking up through the snow. Although they are cold-blooded it amazes me how early in the season that salamanders (like this Marbled Salamander, photographed on March 11th this year) get going. Wet days or evenings in late February or early March are peak times to find these animals out and about, but you still have a few weeks to keep an eye out for them. Marbled and Tiger Salamanders are in a group known as mole salamanders and are so called because they spend much of their life below ground, burrowing through soft earth for invertebrate food [photo by Mike Crewe]. Spring flowers don't really 'happen' out on New Jersey's coastal plain until well into April or even early May, but there is still a mass of color to be appreciated from a surprising source - lawn weeds! Lawns are a totally unnatural habitat and, for most wildlife, about as useful as a concrete parking lot. But their saving grace can come in spring (so long as the manicurists are kept at bay for a while!) when bare patches are covered temporarily by a range of European 'weeds'. Though introduced, many of these species show no inclination to spread into natural areas so they don't really qualify as invasives - and many provide vital nectar for early insects. In this photo, Common Dandelion, Red Dead-nettle, Common Bugle and Common Field Speedwell all add color to a roadside in east Cape May. Get out and see how many you can find [photo by Mike Crewe]. Early spring can show itself in surprising ways. For me, one of the first signs is the return of the Fish Crows in March. Recently, up to 300 have been at a traditional pre-season gathering place on Shunpike Road in Cape May. 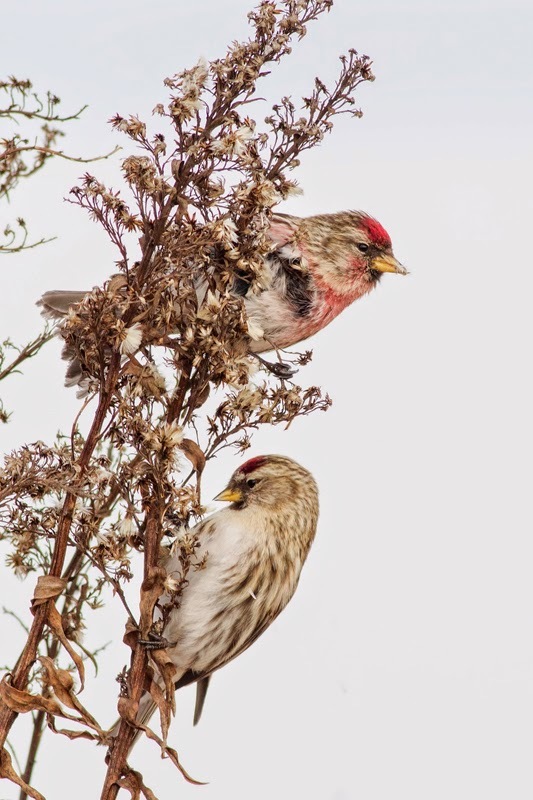 Here, they pair up, performing ritualistic courtship flights and show a lot of interesting behavior that is well worth studying at this time of year. Soon they will disperse to breeding sites (then we have to start battling with them to save the Piping Plovers - another story...) and the spectacle will be over for another year [photo by Mike Crewe]. It's easy enough to miss the switch to spring in the local Red-winged Blackbirds, since the species is here all year. 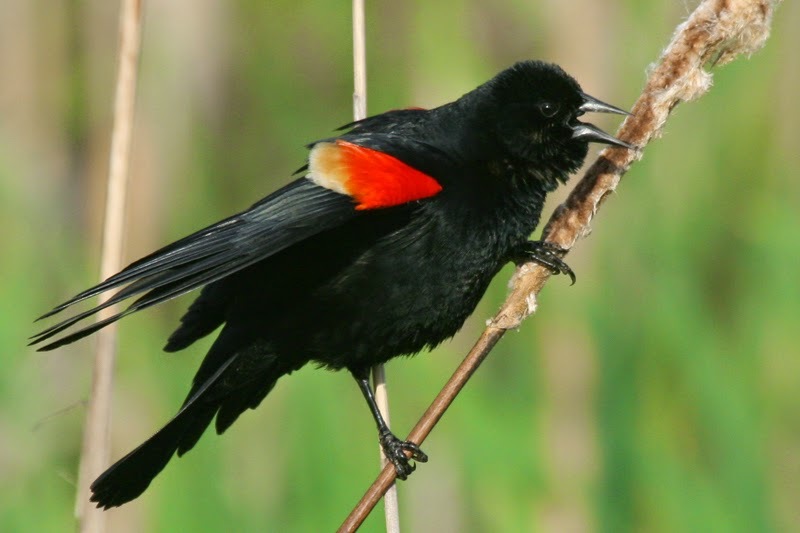 But a walk in any marshy area around Cape May right now will reveal spring fever, as male Red-wings hang on to cattail stems in the breeze and show off their snazzy red epaulets. A sign of spring indeed [photo by Mike Crewe]. Though it is early, you will surely be pleased to hear that warblers are already arriving! First to come is invariably the first pulse of Pine Warblers. This species arrives so early that insects can be tough to find up in the tree canopy, so look for your first Pine Warblers of spring on the ground, where they will be looking for seeds or fallen berries. Around Cape May, a good number also show up at feeders, typically favoring either the suet block, or rummaging around on the ground underneath - this bird was at the Northwood Center on March 14th last year, but we still await their arrival at the feeders this year [photo by Mike Crewe]. It might still be chilly, but spring is most definitely here! Put on gloves and a hat and come and enjoy the magic with us. Check out our Events Calendar and pick something that works for you. See you at Cape May! As if we needed any more reminders of just how sharp a knife edge life can be in the natural world, it seems we are beginning to see the down side of the rather brutal winter that we have been enduring. Our Wednesday morning walk this week took us along the South Cape May Beach - despite the sea fog whipping around the point. 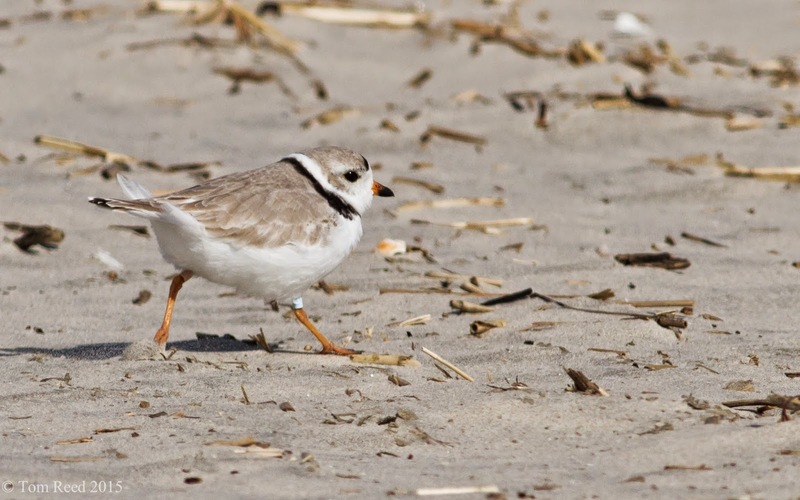 This proved to be a good move when we chanced upon a single Piping Plover that Tom Reed had found shortly before us - the first sighting of the year for Cape May and a sure sign that spring is heading into the next phase of its slow but steady progress. However, what was less joyous was the discovery of a dead Red-necked Grebe and a dead Horned Grebe on the beach. Though this in itself is not unusual - nothing lives forever after all - it did make for some interesting discussion points on the walk and continued into a texting conversation after a number of other dead waterbirds were reported from Two Mile Beach. These included American Black Duck, Surf Scoter, Ruddy Duck and Greater Scaup in the mix. What really opened up the discussion was the discovery that a number of these birds had orange or red cable ties attached - one to each leg and one to each wing. A closer look revealed a numbered, metal disc attached to each corpse. This all seemed very mystifying, but the treatment of these birds was uniform enough to suggest this was being done by someone with a purpose. Opening the conversation up wider, to our friends at various wildlife organizations, eventually got us to the interesting truth - and an opportunity for us all to get involved in something interesting. 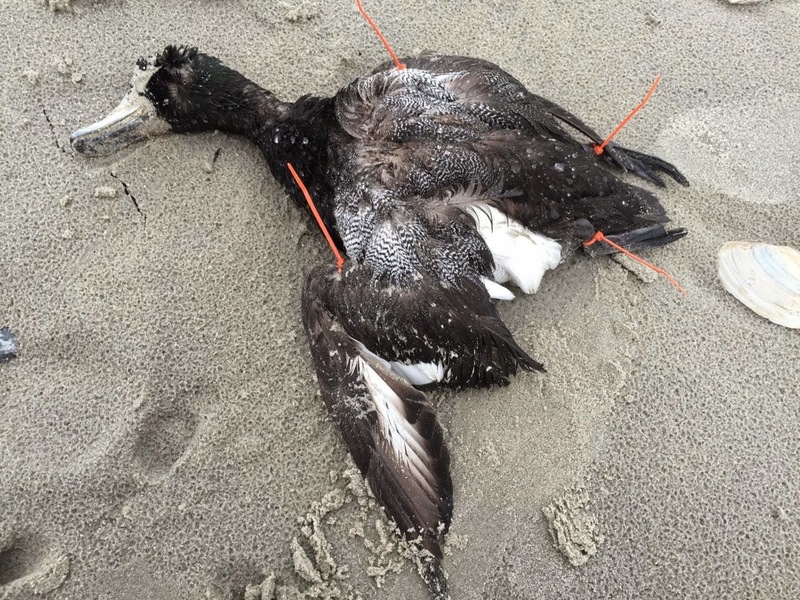 It turns out that the brightly-colored cable ties are attached to the dead birds by researchers from SEANET - the Seabird Ecological Assessment Network. This is all part of a long term study which began back in 2002 in Massachussetts, with research now covering the whole eastern seaboard of the USA. The project uses citizen science volunteers to patrol beaches on a regular basis and tag any dead birds that they find. The bird's location and species are recorded at the time, along with other information and the tags are primarily used to identify birds already counted in subsequent surveys. 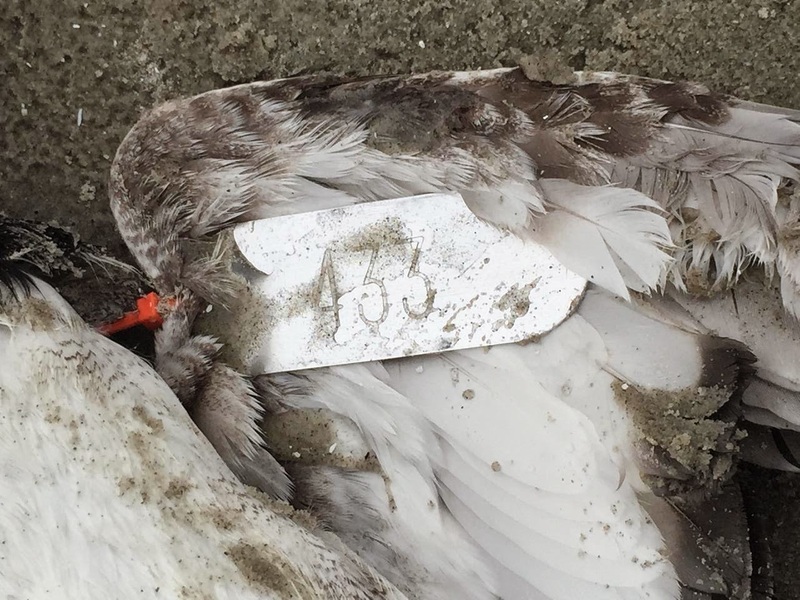 However, the tagging has other uses; it allows the bird to be individually identified such that studies can be made on such things as how long a dead bird might lie around before finally being eaten or decomposing; how far the corpse might be moved by ocean currents; and a whole range of other interesting things. This male Greater Scaup at Two Mile Beach gives a good idea of what to look for. A brightly-colored cable tie is attached to each wing and leg of each dead bird found. 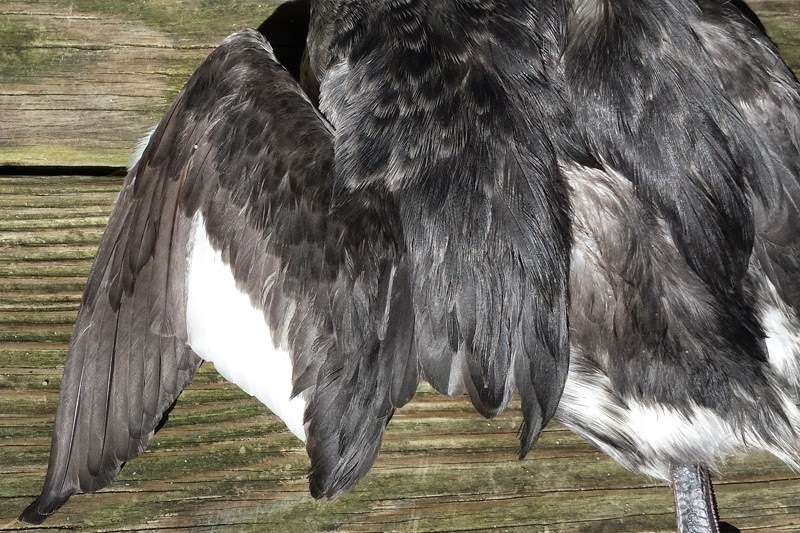 This ensures that, if the body breaks up, pieces can still be identified for longevity purposes, while also making the bird readily identifiable as tagged should it get rolled over, half buried or otherwise moved around by the tides and/or wind [photo by Tom Reed]. There is a lot of information on the SEANET project available on the web; you could visit the SEANET blog for much more on the background and some recent findings of the project, or go to the SEANET website, where you can hook up and become a volunteer if you so wish. There is some fascinating research being carried out by this group and, now when we see those strange birds with their colorful attachments - we can know that the SEANET team have been our way. If you do spot such a bird, do please leave it where it is, as the project relies on natural processes to give them the best data for their work. But you are encouraged to take a photo and report the bird to SEANET - for full details on how to do this, click here. 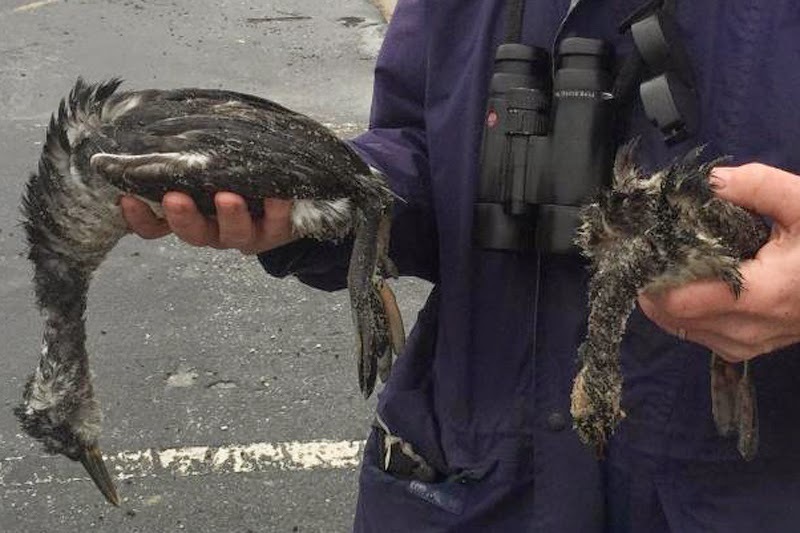 It seems likely that the brutal weather will result in an increase of dead birds being washed up on our bayshores and beaches; local fish and wildlife officer report data showing a noticeable drop in average body weights for a number of duck species in the back bays as a likely result of some very difficult feeding conditions this past couple of months. 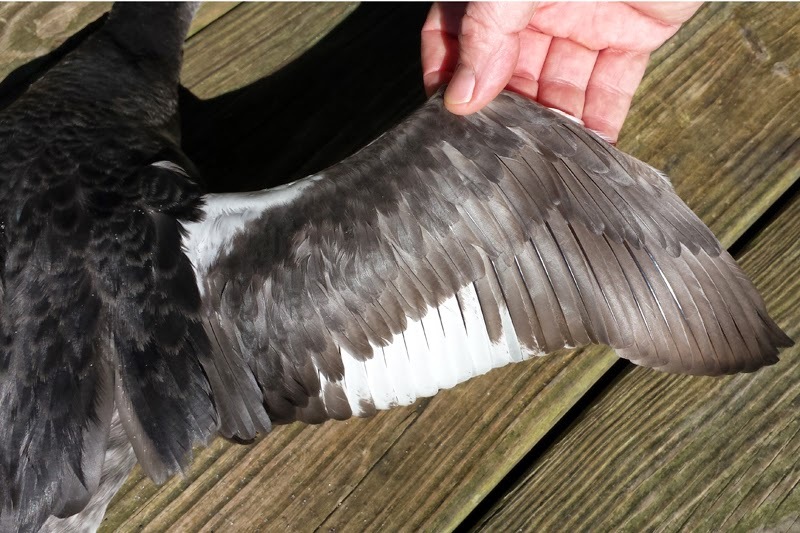 If you find a dead bird on the beaches that is not tagged, you might like to give Cape May Bird Observatory a call with details of the whereabouts of the bird. We have a license to salvage such individuals and they go to museum collections to be prepared and used as study skins for research. Nothing goes to waste if we can help it! IMPORTANT NOTE: Be aware that, in some instances, the corpses of freshwater birds may contain pathogens that can be harmful to humans. We do not encourage anyone without the correct permits and protective equipment to handle such dead specimens. Location Abbreviations/Explanations: CMP (town of Cape May Point); Cold Spring Inlet (entrance to Cape May Harbor, located at south end of the Wildwoods and accessed from Two Mile Beach Unit of Cape May National Wildlife Refuge); WMA (Wildlife Management Area). Access Note: Stone Harbor Point remains CLOSED due to restoration work. Significant ice cover remained on most fresh and brackish water bodies, though the ice on Delaware Bay cleared out between 28 Feb–2 Mar. As many as 11 Tundra Swans took up residence at CMP in recent days (m. ob. ), a decent tally for Cape Island. Daily migration monitoring began at CMP 1 Mar. Notable totals from recent mornings included 57 Lesser Scaup 1 Mar (GD, TR); 28 Northern Pintails and 226 Long-tailed Ducks 4 Mar (GD, TR). Wood Ducks are expected migrants during early-Mar, though 18 that flew north past Stone Harbor made for an excellent total 5 Mar (TB). Other noteworthy waterfowl included typically scarce species such as Canvasback, Redhead, Common Goldeneye, and Common Merganser at several locations through the county (m. ob.). There were no reports of Harlequin Ducks at Cold Spring Inlet this week. A noticeable influx of Red-necked Grebes took place along the immediate coast 1–3 Mar, punctuated by 14+ at CMP (GD, DLP, RC et al.) and 7 near Hereford Inlet (TB) 2 Mar. An American Bittern at Pond Creek Marsh was most recently encountered 28 Feb (MP et al.). A Golden Eagle, likely an active migrant, continued north from Reed's Beach 28 Feb (TR). Rough-legged Hawk continued to be seen in above-average numbers locally. Jake's Landing hosted at least 3 through much of the period (MB et al. ), while another appeared near Tuckahoe 1 Mar (JC). Just beyond our reporting area, as many as 5 Rough-legged Hawks were viewed at the Corbin City portion of Tuckahoe WMA this week (DW). A 'Western' Willet was reported at the Cape May Ferry Terminal 6 Mar (DF, KH), and a handful of Red Knots remained at Two Mile Beach (m. ob.). Otherwise, shorebird reports were again sparse. At least 3 Black-headed Gulls were noted along the lower Delaware Bay shoreline, with recent reports from CMP, Villas, and the Ferry Terminal (m. ob.). A Lesser Black-backed Gull flew past CMP 4 Mar (GD, TR); this species should become more regular during the next few weeks. Single American Kestrels were noticed at Cold Spring 2 Mar (KL) and near Marmora 3 Mar (DF). A snowstorm on 5 Mar produced numerous sightings of "open country" birds the following day. Among these were 25 Horned Larks (MO) and a Lapland Longspur (fide Keekeekerr) at CMP, 22 Horned Larks at Reed's Beach (TR), and 11 Snow Buntings at North Wildwood (TB). Given how harsh the past month's weather has been, the 11 Brown Thrashers at Higbee Beach WMA 1 Mar are worth mentioning (DW). A Vesper Sparrow put in a brief appearance at Two Mile Beach 28 Feb (TR). 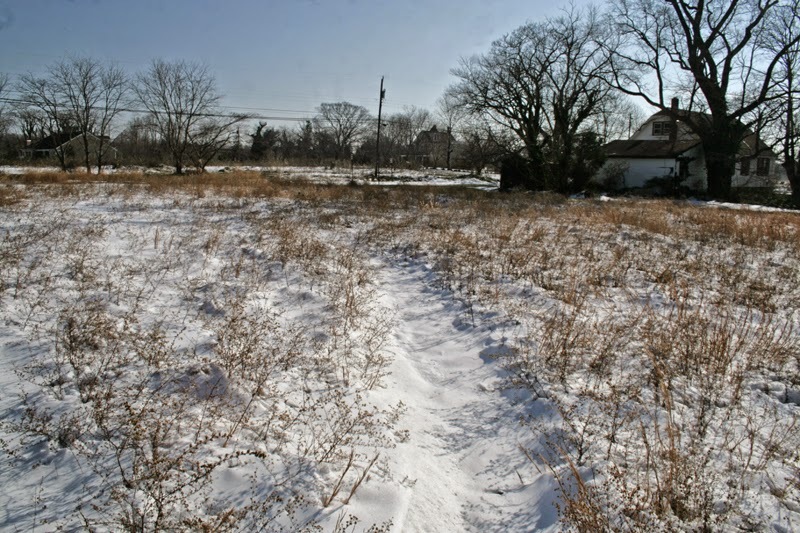 The species tends to avoid Cape May during winter, most often appearing during times of snow cover and/or extreme cold. Tom Baxter (TB), Mike Bisignano (MB), Janet Crawford (JC), Richard Crossley (RC), Glen Davis (GD), Don Freiday (DF), Kathy Horn (KH), David La Puma (DLP), Karl Lukens (KL), Michael O'Brien (MO), Mike Pasquarello (MP), Tom Reed (TR), Dustin Welch (DW). eBird. 2012. eBird: An online database of bird distribution and abundance [web application]. eBird, Cornell Lab of Ornithology, Ithaca, New York. Available: http://www.ebird.org. (Accessed: 6 March 2015). Fogg, B. 2013. Keekeekerr: Recent Text Alerts. Available: http://keekeekerr.com/textalerts/keekeekerr. (Accessed: 6 March 2015). Intellicast. 2015. WINDcast. 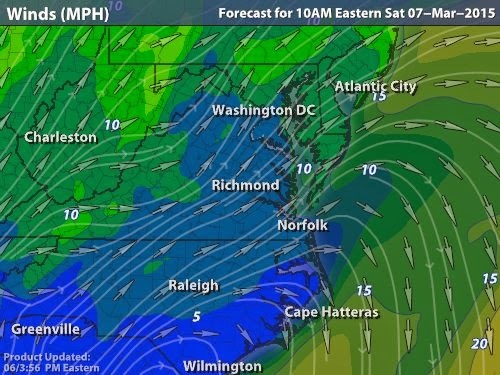 Available: http://www.intellicast.com/National/Wind/WINDcast.aspx (Accessed: 6 March 2015). With the possibility of a foot of snow being unceremoniously dumped upon us today, it certainly seems premature to be thinking about spring just yet - even though there is a clear indication of northward movement of ducks taking place right now. Although drier weather is on its way, things look pretty cold for the coming weekend and we have made the decision to postpone our Woodcock Dance event which was scheduled for this coming Saturday. There is not much sign here as yet that the woodcocks are starting to call and display and, though we could still proceed with the indoor part of the event, it is the moonlight walk to hear and see woodcocks displaying that really makes the event. This is always a popular event so we are re-scheduling for Saturday, April 4th, 6:30-8:30pm. Give us a call to sign up and come and enjoy learning about woodcocks! American Woodcocks struggle when the ground is frozen, or when the snow is deep enough that they can't reach through to look for food. At such times they often congregate on roadsides, where salt run-off can produce thawed areas along the grassy edges. Such birds are very vulnerable to traffic, so do keep an eye out while driving at this time of year [photo by Mike Crewe]. While we are on the subject of winter wildlife, another layer of snow on its way reminds me yet again of what we can do to help wildlife during difficult times. The half acre or so of natural meadow that we have developed at home is a good case in point at this time of year. When we moved in, the area looked like a sheep, shortly after having a full on shear and just before heading for the sheep dip! Nothing of interest grew there; nothing of interest visited. A few European Starlings and Common Grackles would stop by and check it out, maybe the occasional passing American Robin, but that was about it. Roll on a few years and we regularly attract at least six species of sparrow (with others on migration), and a whole bunch of other birds and it is winter in particular that sees the area benefiting wildlife. All you need to do is to let you hair down a bit; we all like a bit of tidiness around the house, but why do so many people feel the need to apply a 'scorched earth' policy to their entire property? Early March is usually the time when our meadow gets its annual haircut but, with the weather the way it is, we will leave it just a little longer and cut it in a couple of weeks. Part of our property the year we moved in. 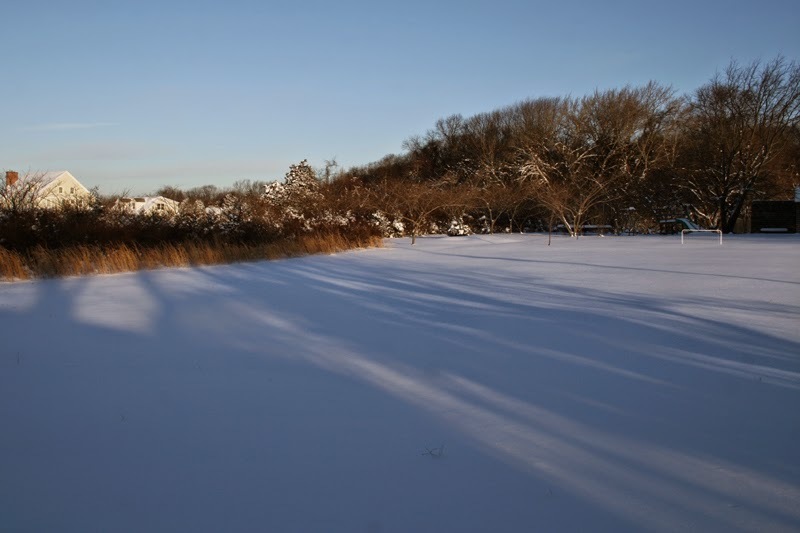 Notice how even a thin cover of snow can make large areas of ground unsuitable for feeding for most birds. If there are any seeds in this patch, they are well hidden and birds are reduced to checking out the thin strip of native Virginia Beard-grass along the back edge [photo by Mike Crewe]. The recent ice storm that we had made for great wildlife photography opportunities. 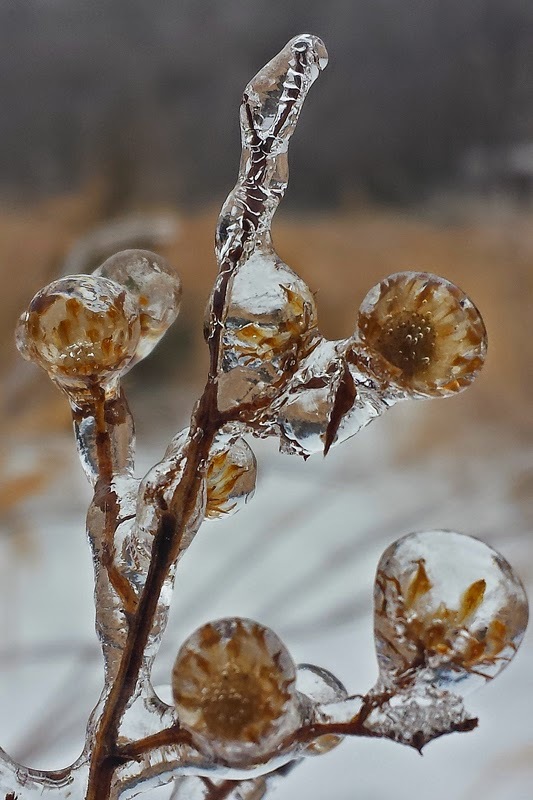 Here, seed heads of Frost Aster are encased in ice [photo by Mike Crewe]. Spring on the way? 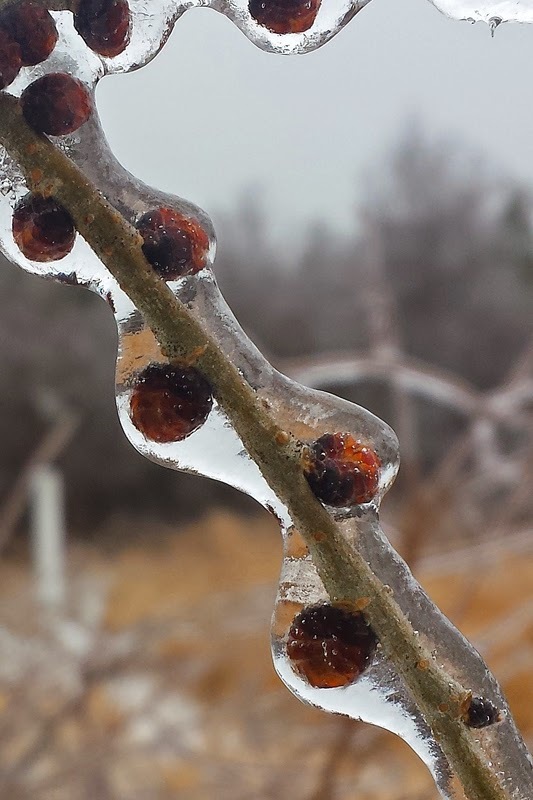 Though these Siberian Elm flower buds are swelling now, a good covering of ice certainly stopped them in their tracks for a while [photo by Mike Crewe]. 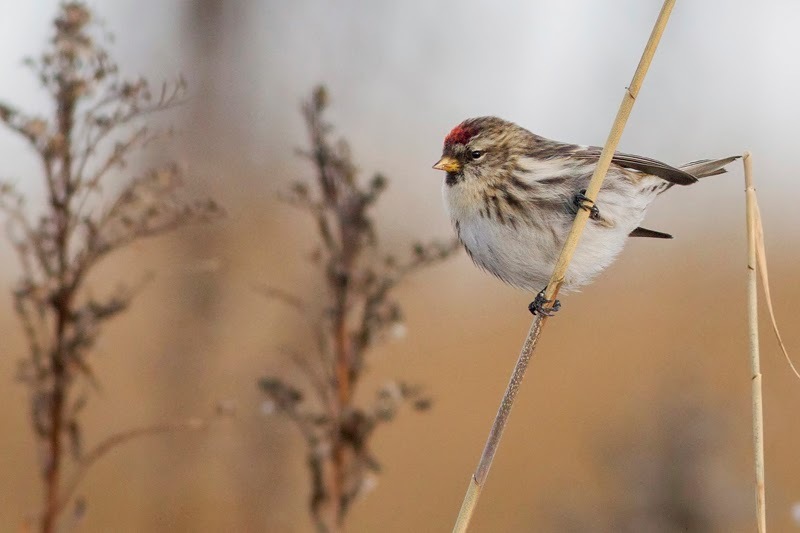 Earlier in the winter there was a little flurry of Common Redpoll activity and several small parties were reported from coastal and bayshore beaches - but the big invasion never happened and the few that showed up quickly moved on. Sam Galick sent me these photos of birds feeding on Seaside Goldenrod seeds [photos by Sam Galick]. Some birds seem not to get the message when migrants move on! 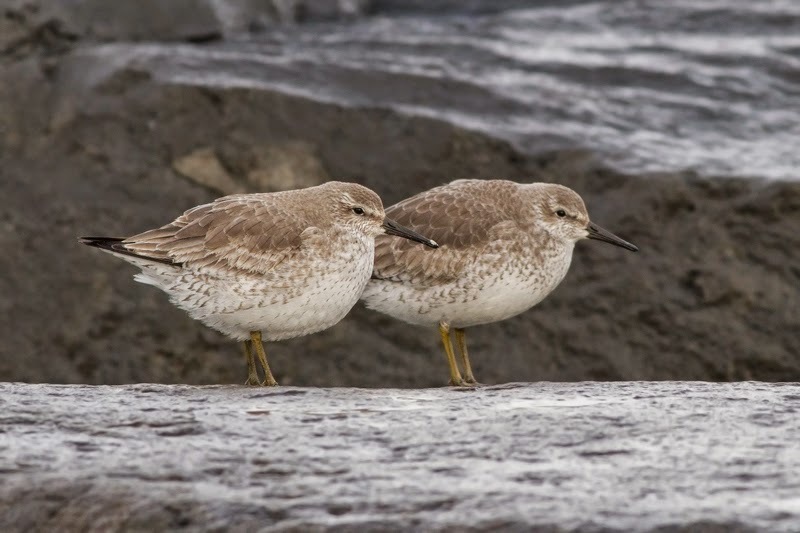 While the vast majority of our Red Knots move well south to winter in Argentina, a few brave the Cape May weather and hang out along the coast - these two were at Two Mile Beach in January [photo by Sam Galick]. Blue-winged Teal like to winter around the Gulf Coast and in the south-east States, but odd birds can be found in our area at times in the winter. This male was at Dennis Creek in January and nicely shows how Blue-winged Teal has a different molt timing to most other dabbling ducks, not acquiring its mating plumage until late winter or early spring [photo by Mike Kilpatrick]. Being out and about is the best way to find out what the birds are doing and can almost always turn up surprises. Though Common Yellowthroats often hang on into winter well to the north of us, a January find of one of these birds is always noteworthy. 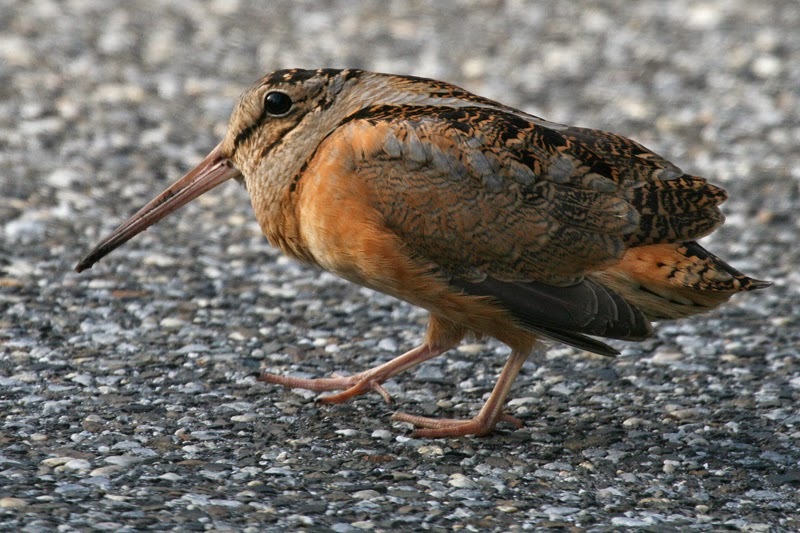 This individual was found at Stone Harbor Point during a quest for wintering sparrows [photo by Mike Kilpatrick]. As we stood overlooking the ice floes exiting the Delaware Bay on a falling tide shortly after dawn this morning, I began to secretly question the wisdom of starting the Cape May Springwatch on March 1st. My phone was reading 20F - a local weather station was giving us 23F - not much of an improvement, but better than the single figure readings that we had been getting a week ago. And so it was that the 2015 Cape May Springwatch began, with Tom Reed at the helm - scribe, counter and data collector. You would be forgiven for expecting me to report that we really didn't see a lot but the truth was very different. Much of the rather static pack ice of recent weeks and finally made its way out into the open sea and there was a good amount of open water for birds to be filtering back into. Black and Surf Scoters, Long-tailed Ducks and a variety of gulls were all moving in small groups - not migration, but some purposeful feeding movements it seems. A single flock of Lesser Scaup contained at least one Redhead, and a female Greater Scaup shot past us at close range. Despite a lot of ice cover, some 25-30 Purple Sandpipers and a few Ruddy Turnstones were moving between the jetties and we notched up at least five each of Red-necked and Horned Grebes. A couple of adult Bald Eagles rode the pack ice at least two miles offshore and could be seen tucking into breakfast. A group of nine female Boat-tailed Grackles dropped onto the stone jetty in front of us - were they on the move? They certainly departed in a northerly direction. Parties of American Robins moved around behind us but were probably just moving between feeding areas. With the weather the way it is, the initiation of spring migration is going to be slow coming, but it is going to be fun being in on it right from the start. There were no big surprises today, other than the fact that there was more to see than I expected; the number of grebes on the move, a scattering of Red-throated Loons, displaying Long-tailed Ducks and a passing Harbor Seal were all much appreciated - and the perfect way to start the day! We'll give you regular updates on how spring is developing and look forward to see you here this spring! Despite the weather you can still birdwatch from the roadside. This male Rusty Blackbird was one of several feeding along Bayshore Road in West Cape May recently and was photographed from the comfort of a car seat (photo by Mike Crewe).